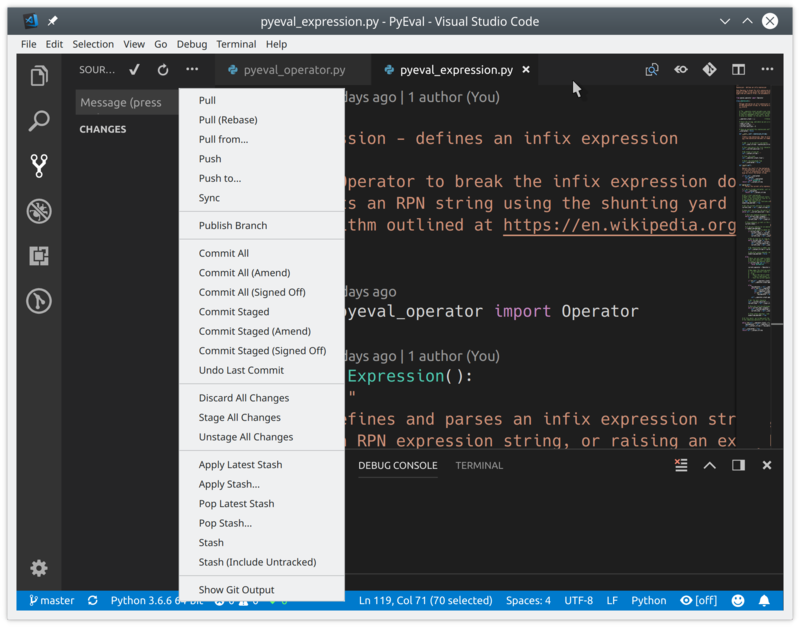 One of the coolest code editors available to programmers, Visual Studio Code, is an open-source, extensible, light-weight editor available on all platforms. 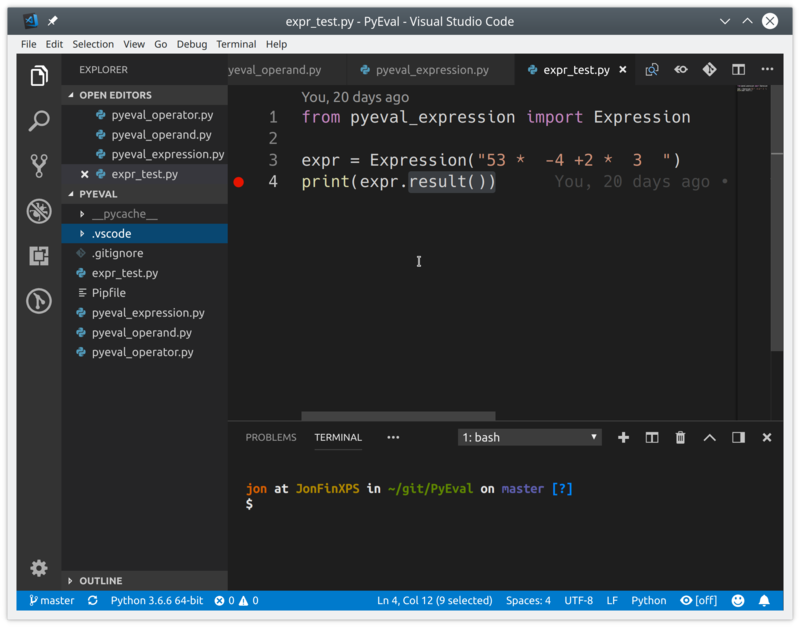 It’s these qualities that make Visual Studio Code from Microsoft very popular, and a great platform for Python development. We assume you are familiar with Python development and already have some form of Python installed on your system (Python 2.7, Python 3.6/3.7, Anaconda, or others). Screenshots and demos for Ubuntu and Windows are provided. Because Visual Studio Code runs on all major platforms, you may see slightly different UI elements and may need to modify certain commands. 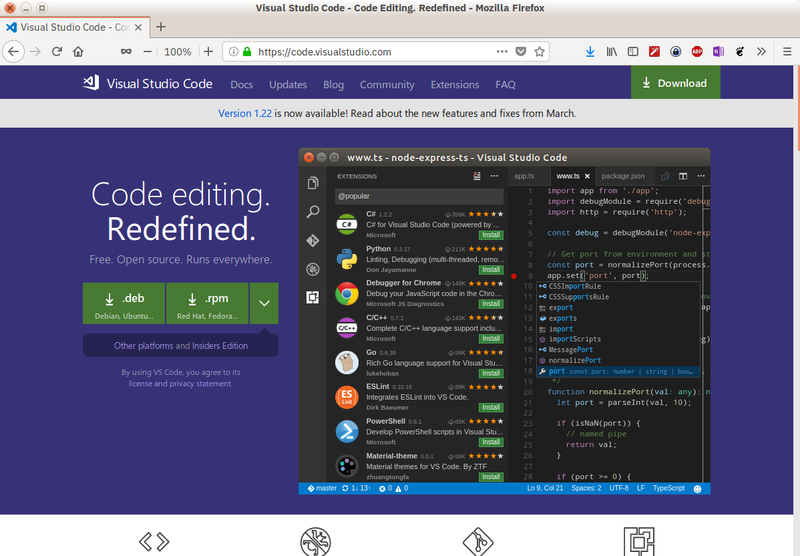 In case you were wondering, Visual Studio Code (or VS Code for short) shares almost nothing other than a name with its larger Windows-based namesake, Visual Studio. Keymaps allow users already familiar with Atom, Sublime Text, Emacs, Vim, PyCharm, or other environments to feel at home. Themes customize the UI whether you like coding in the light, dark, or something more colorful. Language packs provide a localized experience. GitLens provides tons of useful Git features directly in your editing window, including blame annotations and repository exploration features. Auto save is easily turned on by selecting File, Auto Save from the menu. The default delay time is 1000 milliseconds, which is also configurable. Settings Sync allows you to synchronize your VS Code settings across different installations using GitHub. If you work on different machines, this helps keep your environment consistent across them. Docker lets you quickly and easily work with Docker, helping author Dockerfile and docker-compose.yml, package and deploy your projects, and even generate the proper Docker files for your project. Of course, you may discover other useful extensions as you use VS Code. Please share your discoveries and settings in the comments! You can find and install any of the extensions mentioned above in the same manner. 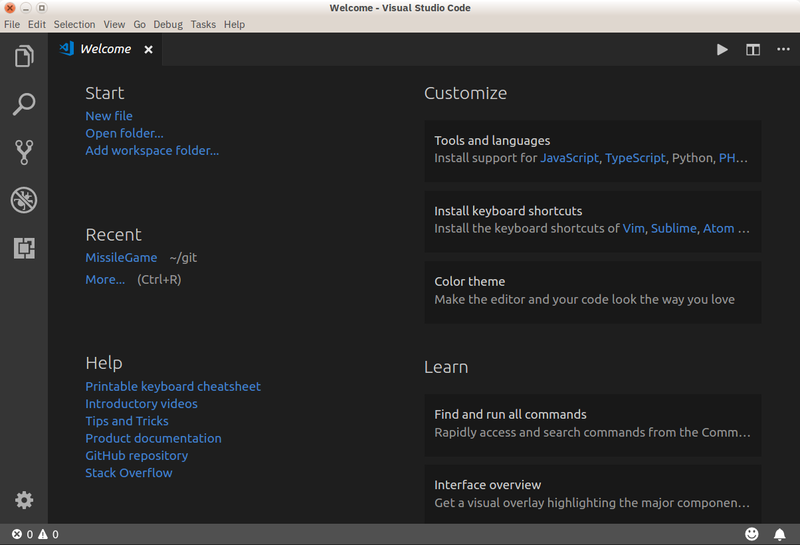 One important thing to mention is that Visual Studio Code is highly configurable through user and workspace settings. User settings are global across all Visual Studio Code instances, while workspace settings are local to the specific folder or project workspace. Workspace settings give VS Code tons of flexibility, and I call out workspace settings throughout this article. Workspace settings are stored as .json files in a folder local to the project workspace called .vscode. Note: The Visual Studio Code UI provides the Command Palette, from which you can search and execute any command without leaving the keyboard. Open the Command Palette using Ctrl+Shift+P, type File: New File, and hit Enter to open a new file. Once a new file is opened, you can being entering code. Wait, what’s going on? Why isn’t Visual Studio Code doing any keyword highlighting, any auto-formatting, or anything really helpful? What gives? The answer is that, right now, VS Code doesn’t know what kind of file it’s dealing with. The buffer is called Untitled-1, and if you look in the lower right corner of the window, you’ll see the words Plain Text. That’s much better! VS Code automatically reformats the file as Python, which you can verify by inspecting the language mode in the lower left corner. If you have multiple Python installations (like Python 2.7, Python 3.x, or Anaconda), you can change which Python interpreter VS Code uses by clicking the language mode indicator, or selecting Python: Select Interpreter from the Command Palette. VS Code supports formatting using pep8 by default, but you can select black or yapf if you wish. As you type this code, VS Code automatically indents the lines under for and if statements for you properly, adds closing parentheses, and makes suggestions for you. That’s the power of IntelliSense working for you. You should see the Terminal pane appear at the bottom of the window, with your code output showing. The Python linting page has complete details on how to setup each linter. Note: The choice of linter is a project workspace setting, and not a global user setting. Using Visual Studio Code on a Python project (as opposed to a single Python file) opens up tons more functionality that lets VS Code truly shine. Let’s take a look at how it works with a larger project. Late in the previous millennium, when I was a much younger programmer, I wrote a calculator program that parsed equations written in infix notation, using an adaptation of Edsger Dijkstra’s shunting yard algorithm. To demonstrate the project-focused features of Visual Studio Code, I began recreating the shunting yard algorithm as an equation evaluation library in Python. To continue following along, feel free to clone the repo locally. VS Code understands, and will use, any virtualenv, pipenv, or conda environments it sees when opened this way. You don’t even need to start the virtual environment first! You can even open a folder from the UI, using File, Open Folder from the menu, Ctrl+K, Ctrl+O from the keyboard, or File:Open Folder from the Command Palette. 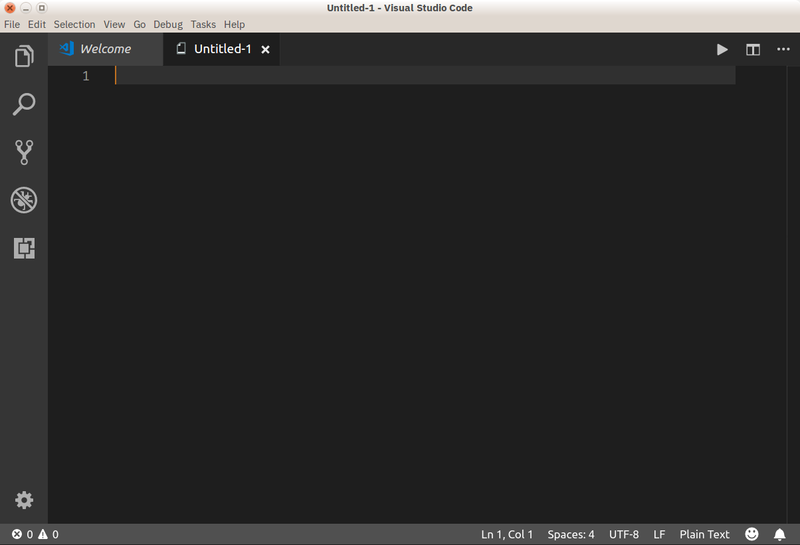 When Visual Studio Code opens the folder, it also opens the files you last had opened. (This is configurable.) You can open, edit, run, and debug any file listed. The Explorer view in the Activity Bar on the left gives you a view of all the files in the folder and shows how many unsaved files exist in the current set of tabs. VS Code can automatically recognize existing Python tests written in the unittest framework, or the pytest or Nose frameworks if those frameworks are installed in the current environment. I have a unit test written in unittest for the equation eval library, which you can use for this example. To run your existing unit tests, from any Python file in the project, right-click and select Run Current Unit Test File. You’ll be prompted to specify the test framework, where in the project to search for tests, and the filename pattern your tests utilize. All of these are saved as workspace settings in your local .vscode/settings.json file and can be modified there. For this equation project, you select unittest, the current folder, and the pattern *_test.py. You can even run individual tests by opening the test file in VS Code, clicking Run Tests on the Status Bar, and selecting the Run Unit Test Method… and the specific test to run. This makes it trivial to address individual test failures and re-run only failed tests, which is a huge time-saver! Test results are shown in the Output pane under Python Test Log. The debugger can control Python apps running in the built-in terminal or an external terminal instance. It can attach to an already running Python instances, and can even debug Django and Flask apps. Debugging code in a single Python file is as simple as starting the debugger using F5. You use F10 and F11 to step over and into functions respectively, and Shift+F5 to exit the debugger. Breakpoints are set using F9, or using the mouse by clicking in the left margin in the editor window. 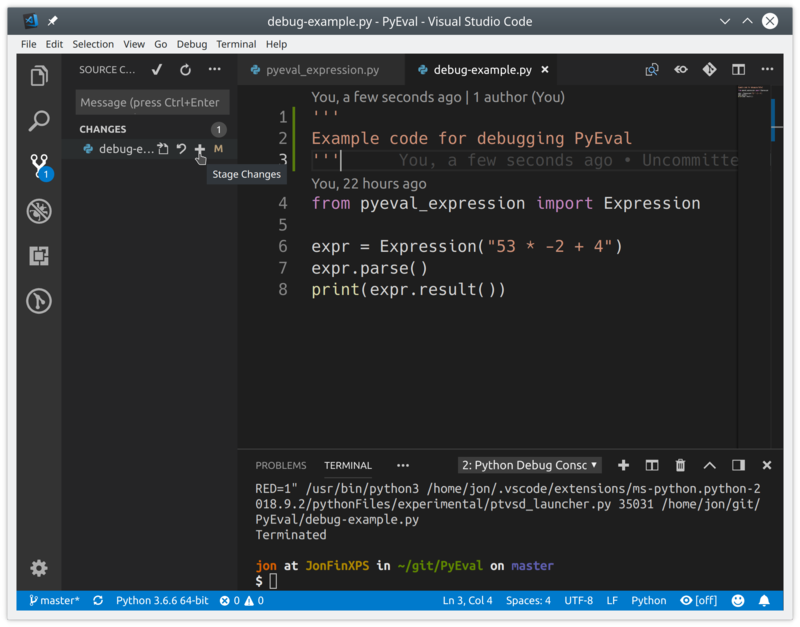 Visual Studio Code will create a debug configuration file under the current folder called .vscode/launch.json, which allows you to setup specific Python configurations as well as settings for debugging specific apps, like Django and Flask. You can even perform remote debugging, and debug Jinja and Django templates. Close the launch.json file in the editor and select the proper configuration for your application from the Configuration drop-down. VS Code will also recognize changes made outside the editor and behave appropriately. You can push local commits to GitHub from within VS Code as well. Select Sync from the Source Control view menu, or click Synchronize Changes on the status bar next to the branch indicator. 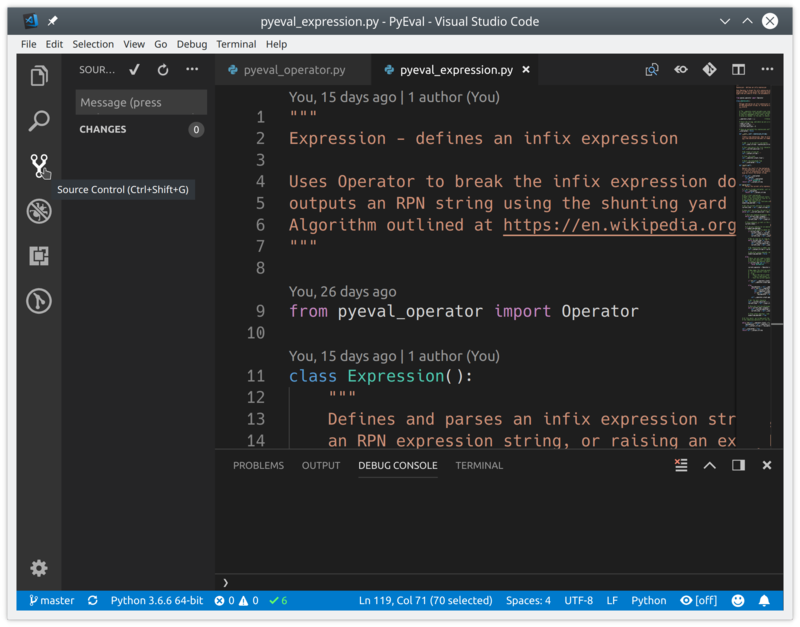 Visual Studio Code has become my default editor for Python and other tasks, and I hope you give it a chance to become yours as well. If you have questions or comments, please reach out in the comments below. 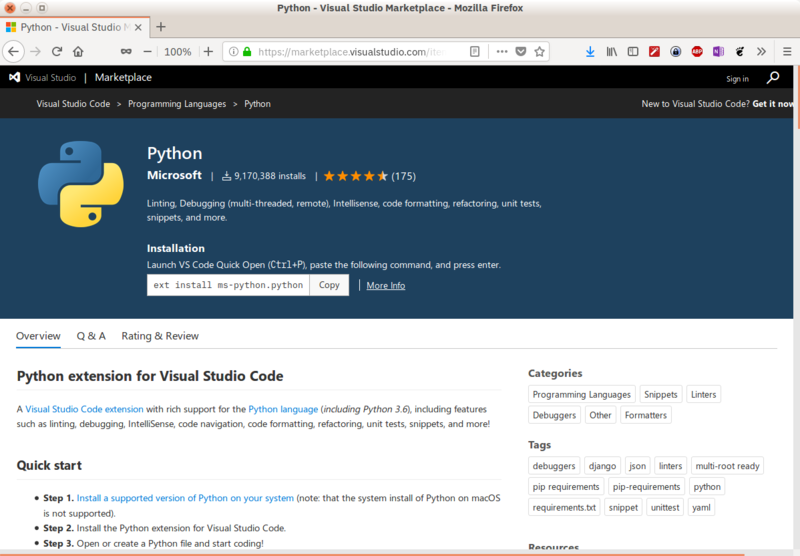 There is also a lot more information at the Visual Studio Code website than we could cover here. The author sends thanks to Dan Taylor from the Visual Studio Code team at Microsoft for his time and invaluable input in this article.